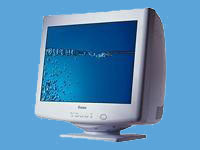 Thin film TFT LCD monitors are now so well established in the marketplace, it's now remarkably difficult to find 'olde worlde' CRT jobs in mainstream shops. 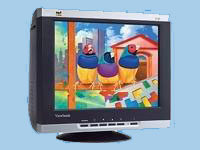 As well as having lower power consumption 'flat panel monitors' also take up a lot less space, and are only a fraction of the weight of conventional counterparts. Like many households, we have a number of PC systems of varying vintages thought the house - the 'good' PC lives in the dining room, and both the kids have one each - made up of cannibalised 'toss outs' - some of which have literally been found on the kerbside and in skips awaiting collection! When the monitor went on one of the cruddy machines, my immediate response was to dig a replacement out of the attic, but unfortunately it didn't support the higher resolutions required by some of the games. I would have been happy to buy a cheap CRT replacement, but found the majority of the local shops only stocked extra-high-specification multisync monitors, presumably it simply isn't worth making good old fashioned 'proper' screens any more, and demand is next to nil. I had resigned myself to committing myself to a 'step change' and replacing the unit with a 'flattie'. Looking round the usual outlets (PC Word, DABS online, even Tesco!) 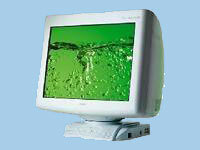 It appeared that the guideline price for a semi-decent 17" monitor was around the £150 mark. What swung it for me was that my local ARGOS branch were offering a £10 voucher for every transaction over £100. I decided to go for the ACER AL174MS monitor - 17" diagonal (actual picture - not tube size, as was the custom with CRT tubes). I had toyed with the idea of just buying a cheap 14" unit, but the cost difference was marginal, and I figured that the higher specification would mean I could keep using the unit for a while longer. Maximum resolution is 1280 x 1024 pixels at a very respectable 0.264 pixels per inch - which by my reckoning is as high as I'm likely to need in the near future. The unit comes with a screen, power cables, inline power supply (12V terminated in a large coaxial plug) and there's inputs for Sub-min 15 pin 'D' connector analogue video, and a 3.5mm jack for the built in speakers. The unit comes with a 3.5mm stereo jack lead, UK and Euro power cables, a stand, and a CD, and video lead. Setting up is simplicity itself - caving connected the cables, and powered up, the system correctly identified a 'plug and prey' monitor, adjusted the drivers within Windows, and simply got on with life! The CD contains a copy of Adobe Acrobat, and a couple of PDF manuals - no specific drivers are needed. The picture itself is crisp, I've not noticed any 'dead' or 'bright' pixels, and the unit automatically readjusts itself whenever screen resolution and frequency is changed. At 5.6Kg, it's considerably lighter than the CRT equivalent, it uses 51 Watts in 'active' mode, which drops to 3w in standby. There is a range of On Screen menus, accessible by pressing various buttons on the front panel, but I didn't need to operate any of them to get a perfectly adequate picture. It doesn't have a built-in USB hub, as hinted at before, the power switch doesn't actually disable the power brick, the speakers are 'passive' - ie no amplifier, and not all systems provide a sufficiently powerful audio output to satisfy most tastes. Saying that - you get pretty much everything you need. Normal 'windows' use is as good, if not better than most CRT pictures of equivalent size, contrast is 350:1, maximum video bandwidth is 135MHz, and the response time is a perfectly reasonable 14ms. DVD and analogue TV (from a card in the PC) is entirely watchable. Given that I got a £10 gift voucher with the unit (offer ends 6 November 2005) I felt that the £149 (less a tenner) I paid for this unit was as good value as you were likely to get anywhere! 'nice to have' would have been a composite or 's-video' video input - and a digital tuner for TV - but given this would have added to the cost, I can't complain! DVI would also have been nice, but that attracts extra duty, so I can also live without it. The lack of an audio amplifier is also a bind -in the meantime I'll keep the external speakers which were already fitted to my sound card. 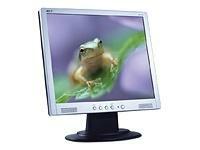 Keep an eye on this monitor - I guess in a few months it'll be going for less than £100. 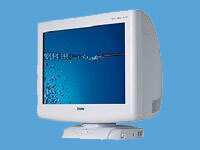 Overall, a very good 'gets what you pays for' monitor, with few frills, but a relatively modest price. Of course - I wasn't able to buy just one unit, having two kids who are highly competitive, I wasn't up for the argument 'how come SHE'S got one and I've not …' so I ended up buying two! I was lightly miffed by Argos's promotion - £10 back for every transaction over £100 SHOULD in my book have meant a £30 cashback, instead, as the cut-off was '£100 or more' I only got twenty notes back, and even so, it was only because I'd had the presence of mind to treat this as two separate sales!